Every once in a while I have a whole night insomnia thing going on; I have no clue why, it just happens. My "routine" for those nights is "dollhouse stuff". As I mentioned before, I am the responsible caretaker of my MIL's dollhouse for the past 10 years, and even if I'm a little too old to play with dolls, you have no idea how much I'm enjoying making stuff for the 'little people' that live in there. One challenge that I face is that there's no way that at 3:00 am I'm going out to get supplies, therefore I work with whatever is available, and get creative. 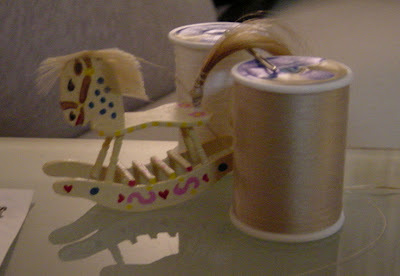 I looked for pictures on the internet, just typing 'rocking horse', to get to the basic construction, only mine was much smaller. Cut the two rockers, the head, the base and glue them together: the 4 legs are round toothpicks (the one that have the sort of wood turning detail on the top), the bars in between the two rockers are square toothpicks cut to size. Popsicle sticks are soft enough that you can cut it with regular scissors, and I used a nail file to smooth the edges. Once dried, a coat of buttery color paint... the surface is so little that in 15 minutes or so I could actually draw the hearts on the rockers and the few details for the head. The saddle is a little piece of leather and two small rings from a random chain, all tied under the 'belly' with some thread. ...and it was morning again! With a screw I punched a little hole in the body of the horse, wrapped the curl with some thread and pushed the tail into the hole, secured with a drop of glue. For the mane, I applied a little glue on the head and glue the hair, and trimmed after was dry. Here's the kid's bedroom with their toys (handmade by moi with some clay). Please note how pretty are the beddings and the chaise-long... totally handmade by my MIL's mom! These dolls are a recent addition (circa from the 1960's), a present from a my mother-in-law's friend (they used to play together when they were in elementary school!). Adorable! I just finished making a dollhouse and everything in it for my niece-what a task! Thanks for sharing this as well! !